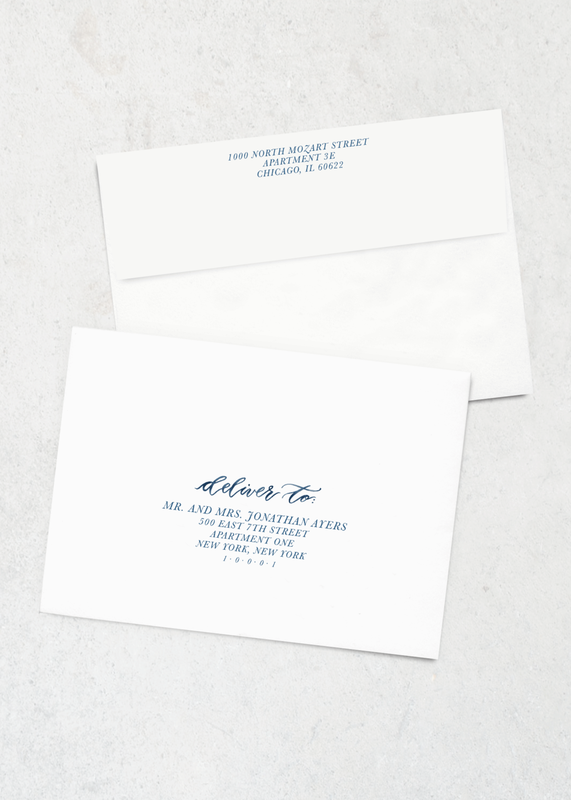 Envelope printing is available in a coordinating font for save the date and invitation guest addresses, invitation & save the date return address flaps, and RSVP envelopes. Printing is only available for this suite in the pictured color. When you purchase envelope printing services, you will receive an emailed link to a spreadsheet template that should be used for submitting guest lists. For RSVP & return address printing, you will receive a form to submit your address exactly as you would like it to appear on the envelope. **Please note that envelope printing is not an option on dark-colored envelopes (sapphire, royal). For an additional fee, white ink envelope printing is available upon request. White ink printing also adds an additional 2 weeks turnaround time. Please contact emily@emilyroseink.com for details.